In 1964, Kenneth Clark set out the problems of loving John Ruskin. One was his fame itself. Like his sometime pupil Oscar Wilde (who, along with other of his Oxford students he persuaded to dig a road in Hinksey in order that they learn the dignity of labour), Ruskin defined the art and culture of his century. “For almost 50 years,” Clark wrote in his book, Ruskin Today, “to read Ruskin was accepted as proof of the possession of a soul.” Gladstone would have made him poet laureate “and was only prevented from doing so by the fact that [Ruskin] was out of his mind”. Ruskin was a man who believed in angels but championed the most radical British artist of his time. He was a social reformer and utopian who was at heart a conservative reactionary and a puritan. He was a brilliant artist who ought to have been a bishop. He hated trains but invented the blog. How can it be that a man so celebrated in his time is only fitfully remembered now, 200 years after his birth – and then mostly for a salacious story that he was too intimidated by the sight of his young wife’s pubic hair to perform on his wedding night? He’s a beardy Victorian worthy, preserved in sepia photographs and unread books with inexplicable titles – Unto This Last, Sesame and Lilies, Praeterita – consigned to the top shelves of charity shops. The problem lies in the fact that Ruskin rejects all those presumptions even in his own lifetime. 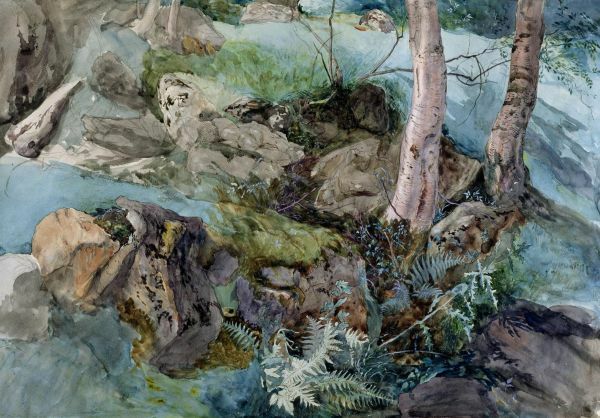 His watercolours of the natural world – from mosses to Swiss mountains – are astonishing, hyper-real representations of something close to his soul, a metaphysical reality. He declined to join the headlong rush of economic progress and rejected the mores of his class. In the famous portrait of him by John Everett Millais – the Pre-Raphaelite artist who, even as he painted the picture in the Scottish Highlands, was about to seduce Ruskin’s young wife, Effie Gray – he stands on a rock by a waterfall, as if dominating the terrain around him. He looks the picture of Victorian rectitude; but he was undermining the century with his crusade. On the wall of a cave deep in the jungles of Borneo, there is an image of a thick-bodied, spindly-legged animal, drawn in reddish ocher. It may be a crude image. But it also is more than 40,000 years old, scientists reported on Wednesday, making this the oldest figurative art in the world. Until now, the oldest known human-made figures were ivory sculptures found in Germany. Scientists have estimated that those figurines — of horses, birds and people — were at most 40,000 years old. Researchers have found older man-made images, but these were abstract patterns, such as crisscrossing lines. The switch to figurative art represented an important shift in how people thought about the world around them — and possibly themselves. The drawing found on silcrete stone in Blombos Cave. Painting from El Castillo cave (Cantabria, Spain). Early Upper Palaeolithic or older. Visual culture – and the associated forms of symbolic communication, are regarded by palaeo-anthropologists as perhaps the defining characteristic of the behaviour of Homo sapiens. One of the great mysteries of archaeology is why figurative art, in the form of the stunningly naturalistic animal depictions, appeared relatively suddenly around 37,000 years ago in the form of small sculpted objects and drawings and engravings on cave and rock shelter walls. Since the discovery and authentication of such Palaeolithic art more than a century ago, theories have abounded as to what this meant to its Ice Age hunter-gatherer creators. But theories often say more about modern preconceptions regarding the function of art – how can we tell if we’re on the right track to understanding the remote and alien societies that created the first images? In a radical new approach to the issue, we applied recent findings from visual neuroscience, perceptual psychology and the archaeology of cave art, that begin to make sense of the intriguing representations and forward what we hope can be tested scientifically. The two new studies don’t just indicate that Neanderthals could make cave art and jewelry. They also establish that Neanderthals were making these things long before modern humans — a blow to the idea that they simply copied their cousins. The earliest known cave paintings made by modern humans are only about 40,000 years old, while Neanderthal cave art is at least 24,000 years older. The oldest known shell jewelry made by modern humans is about 70,000 years old, but Neanderthals were making it 45,000 years before then. When and where did humans develop language? To find out, look deep inside caves, suggests an MIT professor. More precisely, some specific features of cave art may provide clues about how our symbolic, multifaceted language capabilities evolved, according to a new paper co-authored by MIT linguist Shigeru Miyagawa. A key to this idea is that cave art is often located in acoustic “hot spots,” where sound echoes strongly, as some scholars have observed. Those drawings are located in deeper, harder-to-access parts of caves, indicating that acoustics was a principal reason for the placement of drawings within caves. The drawings, in turn, may represent the sounds that early humans generated in those spots. In the new paper, this convergence of sound and drawing is what the authors call a “cross-modality information transfer,” a convergence of auditory information and visual art that, the authors write, “allowed early humans to enhance their ability to convey symbolic thinking.” The combination of sounds and images is one of the things that characterizes human language today, along with its symbolic aspect and its ability to generate infinite new sentences. Cave artists were thus not just early-day Monets, drawing impressions of the outdoors at their leisure. Rather, they may have been engaged in a process of communication. The creation of the moving image represents a technical advance in the arts comparable with the invention of the steam engine during the industrial revolution. The transition from static to moving imagery was a watershed event in human history, through which people discovered a new way of capturing the visible world — or so it seemed. It turns out, however, that long before the advent of civilization, our Paleolithic forebears figured out that movement seen in living creatures around them could, by cunning means, be captured in crafted illusions of movement. Let’s run with the hypothesis that this 14,000 year old artifact is indeed a toy. What does this tell us about its creator and the children for whom it was made? Before people started congregating in large settlements and forming highly stratified societies, they weren’t enmeshed in a struggle for survival where daily life was all about finding the next meal without becoming one. On the contrary, the conditions of life were congenial to the pursuit of crafts that helped cultivate the imagination and promote delight of the young ones. While in our world, animation may most often be used for surrogate parenting — a way of giving kids a blind watcher that frees up parental hands for more pressing matters (like sending and receiving text messages) — I doubt that this was how our ancestors used toys. For one thing, the contemporary challenges of time management are stunningly contemporary. We have accomplished an extraordinary feat: figured out how to live longer than ever while also having a sense that we have less time than ever. Did the Paleolithic dad say: Watch the running deer while I skin this rabbit and mom grinds those acorns? I don’t think so. Much more likely was the age-old bonding experience of shared delight as a child’s face lights up and finds pleasure in near-endless repetition. Paleolithic parents had plenty of time to play with their children. These weren’t over-worked parents looking for ways to occupy neglected children. They were parents whose own lives were inseparable from those of their offspring. This was an epoch in which life was not partitioned into the discrete segments that define our own. These were toys that came straight from the hands of the toy maker. They didn’t have to stand up to comparison with newer, better, more expensive toys; nor were they at risk of getting lost in mountains of discarded toys. Again, a lesson in values: that those who have less, generally have a capacity to appreciate more. It’s easy for Konner and others to dismiss this kind of interest in human origins as being driven by a naive conception of an idyllic natural state, but who if anyone is actually proposing the impossible: a return to a mythical Eden? The issue here isn’t whether we might by some means recreate or return to our Paleolithic past, but rather, how an understanding of that past might better inform the way we perceive the present. We live under the spell of many beguiling technological false promises, none more pernicious than the notion that doing things faster, frees time. The promise of the future is always that it’s going to be better. When it turns out that human beings cracked the code of animation 14 to 20,000 years ago, this should give us pause to consider not merely the significance of this event as a technological breakthrough. We can also reflect on the differences between then and now in terms of how this facility in representation gets utilized in human culture. Thanks to the invention of and portability of the animated GIF, it’s now possible for humans en masse to catch a glimpse of a prehistoric precursor of the very same technology: still images conjured to create the illusion of movement. What is not the same is the way human minds are typically engaging with the technology. I would argue that the Paleolithic human mind, operating in its relatively uncluttered world, would, with delight and with relatively undistracted attention appreciate the full effect. The moving deer would not only be captivating but perhaps also magical. While the motion might rely on a way of tricking the eye, the toy might thereby be infused with the spirit of the deer. While the child was entertained he was perhaps also receiving an early initiation in the art of hunting. For the audience of the animated GIF, however, the most common effect is at most to prompt a momentary muscle-flex — a retweet — perhaps accompanied with an audible reaction — “cool” — as within a second or two attention turns elsewhere. Never has humanity been so well-fed while also experiencing so much growing hunger. Our restless attention forever longs for more when the present never seems to provide enough. As we go forward, we also go backward, and not in a good way.